Son No 2 came home for the weekend, the day after bonfire night, and the next day immediately cadged some money to get a haircut. Curiously all my sons, like the Queen, don’t seem to carry any money about on their person. Tenner in hand he made a dash for the local barber’s – whose hair cutting skills are confined to the use of one of those electronic hair clipper things, that shave the men’s (and women for all I know) heads according to various ‘grades’, and the hair cutees all come out looking scarily like they’ve spent some time in Wandsworth jail. Oh, why don’t my sons favour the flowing locks of your average Downton Abbey male? Unbelievably I’ve only just started watching Downton Abbey, and settled down to the last ever series thinking I was in for a sedate and upper crust treat, when what I got was a stately blood bath – literally; when one of the downstairs lot decided to take a long soak in a bath full of his own blood, after his lordship upstairs had vomited up buckets of blood a couple of weeks before. Maybe they got Stephen King in as script supervisor. 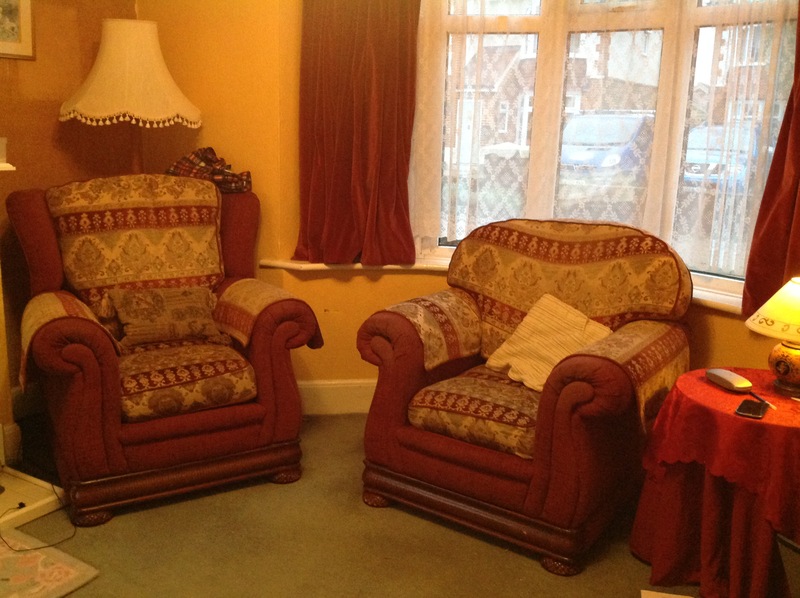 On returning with a snazzy, new, clippered head of hair, son No 2 ensconced himself in the corner armchair and remarked, a propos of nothing, that did I realise our lounge was done out in the Gryffindor house colours. No, I had not realised this, which I should have done being that Sky had inflicted every Harry Potter movie on the nation in an endless, magical loop over half term. But being as I’d decorated the lounge well before the advent of the Harry Potter phenomenon, the thought hadn’t occurred that we’ve been essentially living in the Gryffindor common room all these years. There does seem to be an alarming preponderance of red and gold. I think I’m in need of that Hogwarts little known (and little used to be honest) interior decoration spell – Mutatio Atrium Ikea! The second son had come home to pick up his ‘fancy’ shoes. What a lovely word that is – fancy – it’s so little used these days when referring to something elaborate in decoration, which the fancy shoes certainly are, with their suede and leather and pointy toes. I recollect it from school days, when if some kid was getting above their station you went ‘ooh fancy pants’. I paused here to type ‘fancy pants’ into Google and astonishingly (or not) there’s a Fancy Pants Adventure Game out there, and oddly enough the titular hero, the aptly named Fancy Pants Man (I kid you not, or maybe I do) appears to be sporting the same hair cut as son No 2. Once the son was nicely settled in the Gryffindor armchair, laptop at the ready, I immediately began the motherly interrogation (the lamp directly above his head rather added to the whole interrogation effect) for roughly 3 hours, whilst at the same time forcing him to watch ‘The Muppet Christmas Carol.’ This nightmare scenario led to the son drifting off now and again – I can only assume to a better place – whilst muttering ‘Uuhh?’ and ‘what?’ every so often. The husband and I didn’t do fireworks on November 5th,, mostly because it was raining and also because it felt weird for hubby and I to stand around in the unkempt garden, lighting fireworks and going ‘oohh’ and Aahh’ by our lonesome selves. But son No 2’s homecoming on the 7th meant that the husband could lash out on loads of fireworks (it was a firework BOGOF down at Sainsbury’s, so the room out the back looked like a pyromaniac’s paradise.) However, the husband is also a man of thrift and, unbeknownst to me, had stashed away a load of fireworks last year in the garage, which he’d got from some bloke who had apparently sidled up and whispered ‘wanna buy some cheap fireworks mate?’ in his ear. Whereas you and I would have run a mile from such an encounter, the hubby had merely driven his stash home with gratitude, stuck them in the garage and forgotten all about them – until last Saturday that is. So there we were Saturday night, determined to mark the occasion of Guy Fawkes’ being discovered in the cellars of the Houses of Parliament, with 36 barrels of gunpowder about his person – even though I don’t particularly like fireworks or the notion of 17th century terrorism. There was a mountain of the BOGOF ones to get through. The night was strangely calm and mild for the time of year, which made for copious amounts of smoke every time a roman candle went off, or one of those ones that sporadically just keep on going and going, until you think ok we get the point now so could you just stop it please. The smoke became so dense that neither husband or son could see where they were going and walked about, torches in hand, arms outstretched like zombies. I don’t light fireworks, leaving that up to the men, or go outside into the smoke to watch them – ever. Not since the year a lit firework fell over and then shot across the ground hitting me right in the derriere, causing me to jig around like a demented Irish dancer; the husband to double over with laughter, and leaving a mark that took months to fade. It was very, very PHUNNY. And a lesson that dodgy, damp fireworks, like the world, will end not with a bang but a whimper. I do not attend bonfires. Being a Papist , albeit defrocked, and having at some time worked for the Fawkes family I do not wish to take part in the burning ritual even in effigy.